New Website for Data Vendors: we are delighted to announce the launch of our new vendor website – https://sellaltdata.com/. Focusing on helping data vendors sell data, we would welcome any feedback you have on it. Performance of Eagle Alpha’s Search Signal Dataset: the Search Signals dataset provides a strong indicator of future revenue performance for a company. This is true whether analyzing momentum in quarter-on-quarter growth or comparing historic revenue “calls” to moves in consensus expectations. Contact enquiries@eaglealpha.com to learn more. 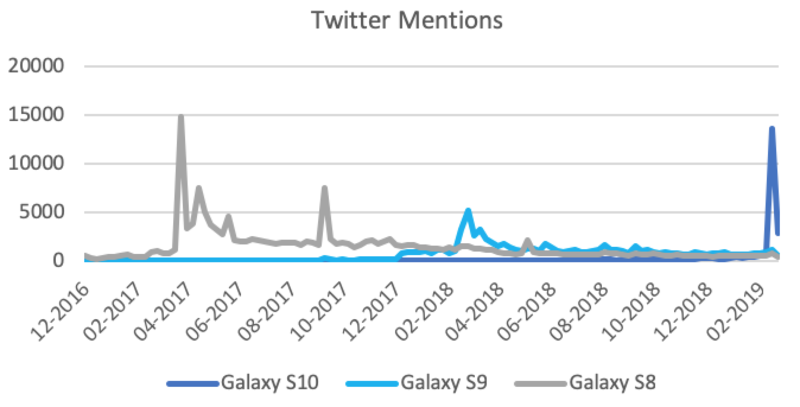 Consumer Interest Rebounds for Samsung Phones: online search and Twitter content are both pointing to a rebound in consumer interest in Samsung’s new Galaxy series of phones. The data is positive compared to the weakness seen in the S9 series last year. Text analytics provider meeting funds in NYC on March 7th and 8th. App usage data provider meeting funds in Paris and Switzerland on March 12th and 13th. Patent data provider meeting funds in Boston on March 12th and NYC on March 13th and 14th. Quant: this vendor provides economically predictive social media impact and sentiment data from a segment of investors who have been identified as being influential in relation to Russell 1,000 Index companies. Our Data Sourcing clients can view the full profile here. Discretionary: this vendor collects 100% of U.S. waterborne import and export bills of lading. Data is collected, processed and distributed on a daily basis. Our Data Sourcing clients can view the full profile here. New dataset: this vendor aggregates car shopper data to track retail demand, competitive trends, media effectiveness and cross-shopping. The basket of metrics for its automotive clients is a very powerful predictor of consumer intent. Our Data Sourcing clients can view the full profile here. Alpha Focus Session – Search Data: the Search Signals dataset provides a strong indicator of future revenue performance for a company. This is true whether analyzing momentum in quarter-on-quarter growth or comparing historic revenue “calls” to moves in consensus expectations. Contact enquiries@eaglealpha.com to learn more. Free Profile In Our Database: any vendor can receive free leads from Eagle Alpha if they complete a profile on our database. Contact us to learn more: enquiries@eaglealpha.com. Data Monetization Seminars: we hosted seminars to educate vendors, VCs and PEs on how to successfully monetize data. Email enquiries@eaglealpha.com if you would like to participate in future seminars. Monthly Webinars: we run webinars covering topics of datasets in demand, dataset pricing and mapping. Contact us to attend the next webinar in March – dataenquiries@eaglealpha.com. Event Exposure: Singapore on March 22nd; New York on May 15th, London in October, New York in December. Contact us for further information – enquiries@eaglealpha.com. New data sources make it harder for executives to mislead investors. Alternative data has become a hot topic on Wall Street, but Nasdaq’s CEO says the US needs better data privacy policies.